Creating hyperlink bookmarks for your WordPress site give visitors a way to jump to the section of the article they need the most, saving them time. 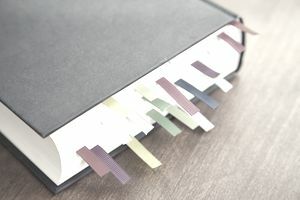 If you Google "how to create bookmarks in WordPress," you'll come up with overly complicated ways of creating bookmark hyperlinks, but it is actually a rather simple process. First, you must create an anchor tag where you want the link to jump to on the page. It is what identifies something as a bookmark. When someone clicks on a link, their cursor will jump to the exact point on the page. Let's say you've created a list of FAQs. The answers are short, so you want to put them all on one page. Put a list of the questions that will be answered at the top of the page. When studying metrics, you will often find that web visitors will jump to the question they need to be answered, then reread the article from top to bottom. This maximizes time on the page. Switch to text mode by entering the code in your HTML editor. Now position your cursor. Move it to the spot you want the link to jump to. You might want to create the bookmark a couple of lines above the actual place because some browsers will move the cursor a line or two below where you tell the cursor to go. Now name the bookmark to create the beginning anchor tag. You can use numbers, letters, upper or lower case, but no spaces or symbols. Then create the end tag. You will not put display text between the beginning and ending tags as you normally would when creating a hyperlink. Here's an example. Your page should look like this when you're finished. Just change all the brackets – [ ] – to the left and right HTML brackets. The next and final step is to create the actual hyperlink that will jump to the bookmarked place you just created when you click on it. Highlight the text you want to turn into a hyperlink to your bookmark. You can enter this in HTML or use the "Visual" editor and click on the little chain icon to create a hyperlink in the "easy" mode.